In 1991, following the collapse of the Soviet Union, the city of Leningrad was renamed St Petersburg. A year later, the Kirov Theatre and its resident companies followed suit by abandoning the name that had commemorated an assassinated Soviet regional apparatchik and readopting its pre-revolutionary Tsarist "Mariinsky" designation. The performances on this disc were, I think, captured in the brief window of time between those two events - a fact that appears to cause some apparent inconsistency in the booklet notes where we find attributions to both the "Kirov" Ballet and the Orchestra of the "Mariinsky" Theatre. In compiling the details given above, I have followed the forms of words found in the booklet. Confusing nomenclature aside, these sequences were filmed during a period when the St Petersburg ballet company was going through something of a golden age. That success owed a great deal to two individuals. The first was Oleg Vinogradov, the company's artistic director and chief choreographer for two decades until 1997. The second was its vastly experienced principal conductor of the time, Viktor Fedotov; see here for an affectionate and perceptive obituary. 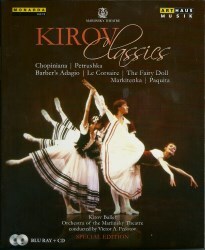 The seven ballet excerpts featured on this disc – seen before in other media incarnations but now made available in this Blu-ray format as a “special edition” - offer welcome opportunities for many of the company's stars of the time to demonstrate the artistry that made their reputations. Altynai Asylmuratova, Konstantin Zaklinsky, Yelena Pankova and Anna Polikarpova are seen in Chopiniana; Vyatislav Okunev and Sergei Vikharev dance Petrushka; Barber's adagio sees Yelena Yevteeva and Eldar Aliev take centre-stage, while the virtuosic Le corsaire pas de deux is danced by Lyubov Kunakova and Faroukh Ruzimatov for whom the role of the slave Ali has always been something of a party-piece. Moving on, charismatic Larissa Lezhnina is joined in The fairy doll by the drolly comic duo of Dmitry Gruzdev and Yaroslavl Fadayev; the pas de six from Markitenka (better known in the West as La vivandière) features Pankova once again, along with Irina Sitnikova, Alexander Koltun, Irina Zhelonkhina and Olga Melnikova; and a final lengthy and spectacular excerpt from Paquita sees accomplished performances from Yulia Makhalina and the athletic Igor Zelensky in the leading roles, while Pankova and Irina Sitnikova are joined by Grigory Chicherin in the pas de trois and Zhelonkhina, Kunakova, Lezhnina, Koltun and Veronika Ivanova dance the variations. All the soloists perform the various excerpts consistently to the highest technical standards. These were not live performances, however, and so it would, in any case, have been a straightforward exercise to re-shoot any unsatisfactory sequences. The absence of an audience does, though, deprive the dancing of an important element of atmosphere, so that one is repeatedly - if only momentarily - thrown by the absence of applause of any kind, let alone the enthusiastic ovations that would undoubtedly have been generated in real theatrical performances. While all the solo artists are superb, the corps de ballet is, though, not as precisely drilled as one might have expected. Once or twice, indeed, the dancers' coordination is positively sloppy. That comes as something of a surprise, given Russian companies' traditionally high standards in that regard, as well as the aforementioned opportunity for retakes. It reinforces, however, the premise that this programme was probably designed to showcase the company's top soloists. The director has opted for spare sets that maximise the space available for the dancers. Paquita, for example, is presented on a stage that's bare except for large candelabras to each side. Given, however, that we are not being presented with complete storylines, the lack of any scene-setting materials is a justifiable decision. Mentioning that stage, I assume, by the way, that this programme was filmed - by Danish TV - in the Mariinsky Theatre's own auditorium, though the documentation fails to elucidate the point. This is, as far as I am aware, the first time that this 24 years old programme has been issued on a Blu-ray disc. The original 1991 recording was not made using HD technology, so it would be idle to pretend that its picture quality can compete with that of the finest modern productions. Even so, I note that the packaging suggests that the disc's resolution is "1080i High Definition" with no qualifying mention of any upscaling process having been applied to the original material. Contrast that with the box that holds Arthaus Musik's Blu-ray release of the Kirov's Sleeping beauty (108 145), filmed at about the same time, and you will see that the packaging there does specify "1080i High Definition (Upscale)". The omission of that rather important qualification on this Kirov classics disc is therefore something of a mystery. In practice, whether through upscaling or some other mysterious process, this Blu-ray version marks a step up from its DVD incarnation, although, if your Blu-ray player, like mine, automatically upscales older DVDs so as to present them in the best possible quality, I think that you would be hard put to spot much of a real difference. The sound quality is very impressive and it is good to have Maestro Fedotov's superbly idiomatic - and entirely balletic - interpretations captured for posterity. The package, incidentally, also contains a separate 70 minutes long CD which offers "the Kirov Classics live soundtrack", though in a version that has been abbreviated to greater or lesser extents. The opening Chopiniana is cut from 31:55 to 12:13, for instance, and, at the other end of the programme the 34:03 of the danced version of Paquita is slashed to a mere 3:31 in its CD form. It's good, however, to have these tracks as a bonus, especially when such music as that from The fairy doll, Markitenka and Paquita are not otherwise too widely available. Incidentally, the packaging of this release is a stiff cardboard folder. That sort of thing can sometimes, as I know to my own cost, arrive in a damaged state in the post and, although delivery was safely made on this occasion, that's why my own preference is always for rigid plastic cases. Looking at that packaging, it’s interesting, too, to see a change in Arthaus Musik's marketing strategy for this release. When I bought the DVD version of Kirov classics some years ago, its cover displayed a shot of Petrushka that would, I suspect, have had little appeal to casual browsers who were lovers of the grace and beauty of classical ballet. That's now been replaced by one from Markitenka that far better conveys what the bulk of material on this delightful disc, accorded, entirely appropriately, the accolade of "classics", is all about.